At Perfect Touch Interiors, we are masters in painting techniques and preparation, selecting paint colors and finishes, as well as keeping up with decorating and designing trends. With a portfolio spanning some of Toronto's most exclusive homes, you can trust PTI to paint your interior or exterior space. Our goal is to exceed your expectations every time! PTI presents a variety of textures, styles and techniques for a client to choose. All interior elements are taken on with the utmost care. Please do come back and visit as we are in the process of re-designing our site to bring you a better experience. Call us today at 647-891-9473 to book your free quote! Coyright 2012. All Rights Reserved. 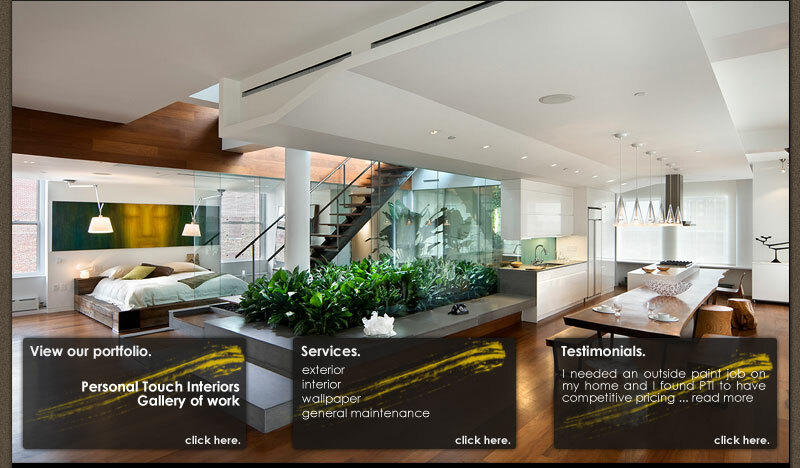 Personal Touch Interiors Inc.
Site Design by Designworx Media Group.